White areas indicate nations that remained neutral throughout the course of World War I.
Bessarabia. Today occupying parts of Ukraine and Moldova, Bessarabia had long been an important agricultural area and its Danube Valley had served as an entry way for invading armies seeking conquest in Russia. The Russians gained control during the 19th century, but following the Bolshevik Revolution (1917) local forces declared the area to be an autonomous republic. Bessarabia later formally split from Soviet Russia and joined Romania, an arrangement that remained until 1940 when the region was seized by the Soviet Union. Estonia. Sharing a similar earlier history with Latvia, Estonia was dominated by German rulers who forced local resident into serfdom. Portions of the territory were later controlled by Sweden and Poland, but the German estates remained. Russia dominated the region after 1720. The collapse of the Russian war effort in World War I was followed by the proclamation of Estonian independence in 1918. 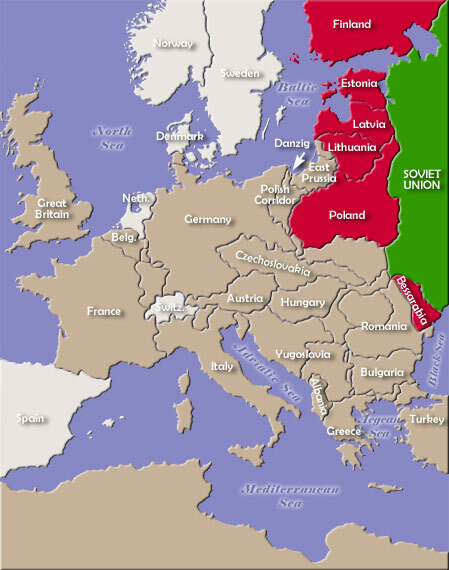 Red Army forces resisted and Soviet Russia did not recognize Estonia until 1920. The area was reoccupied by the U.S.S.R. in June 1940, later taken into the Soviet Union and then occupied by Germany in 1941.